The Windows Vista Sidebar can display a number of so called gadgets that display all kind of information such as pictures, news or other information like eBay auctions. Some users really like the Windows Vista Sidebar although it uses a large portion of the computer memory. Windows Vista does not really come with an option to backup and restore the gadgets that are currently showing in the Windows Vista Sidebar. 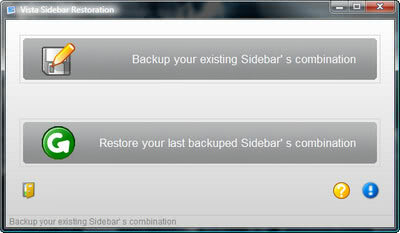 Vista Sidebar Restoration 8.9 is a software program that can backup the existing Windows Vista Sidebar settings. The Windows Vista Sidebar Backup tool will backup the exact layout of the active gadgets and their settings in one click and can also restore them that easily. Uninstalled gadgets are excluded from the backups. Backing up the Windows Vista Sidebar gadgets might come in handy when the gadgets get tangled or if the gadgets should be moved to another computer. You can backup all data in here which can come in handy when you are switching computers for instance, or when you need to restore settings that have changed in the meantime, or only the settings.ini file contained in the folder which lists all the customizations that you have made. While it may not be as comfortable to use as an automated program that backs up everything on click, it at least enables you to backup your sidebar files and data on Vista whenever you want. To restore the settings and files, simply copy the backup into the folder on the same or a new machine. Vista sidebar? Who uses the sidebar? Less is more. I don’t use it :-P .
Saving the complete package is the way to do it.. So you can make an real backup. There is now save as option… useless. Its just an anoing peace of software.